Argenteuil Manet, Edouard , 1832-83, French painter, b. Paris. The son of a magistate, Manet went to sea rather..
At the Beach Manet, Edouard, 1832-83, French painter, b. Paris. The son of a magistate, Manet went to sea rather ..
At the Races Manet, Edouard, 1832-83, French painter, b. Paris. The son of a magistate, Manet went to sea rather ..
A Bar at the Folies-Bergere Manet, Edouard, 1832-83, French painter, b. Paris. The son of a magistate, Manet went to sea rather ..
Boating Manet, Edouard, 1832-83, French painter, b. Paris. 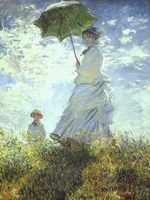 The son of a magistate, Manet went to sea rather ..
A Corner of the ..